CORNWALL, Ontario - The Cornwall and District Labour Council hosted its annual International Women’s Day breakfast on Saturday, at the Best Western Parkway Inn. CORNWALL – While everyone wishes they could have a bit more in the bank, Michelle Walrond is pushing for it to be a reality. On Thursday, ACORN Ottawa held a protest outside the office of Liberal MPP Yasir Naqvi to eliminate the ODSP income clawback. Under ODSP rules, recipients lose 50 cents for every dollar earned. 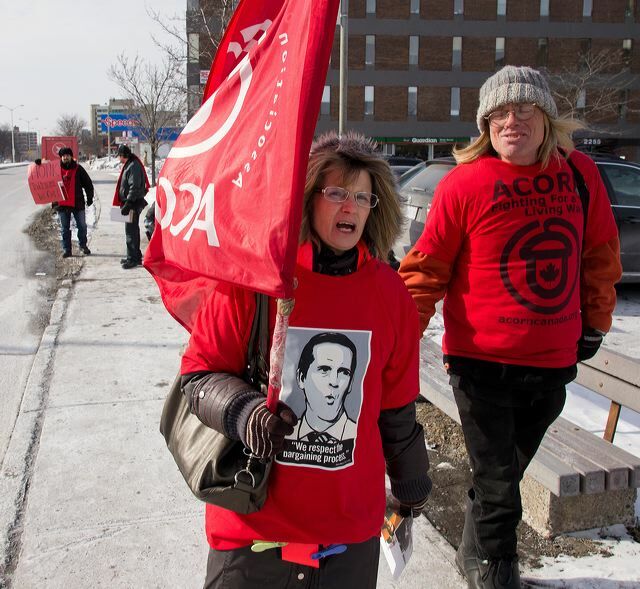 ACORN members David Thomasson and Kat Fortin spoke later that day by telephone about the issue. Check out these great pictures of our rally today in Ottawa outside of MPP Bob Chiarelli's office to Stop the Income Clawback for Social Assistance Recipients! 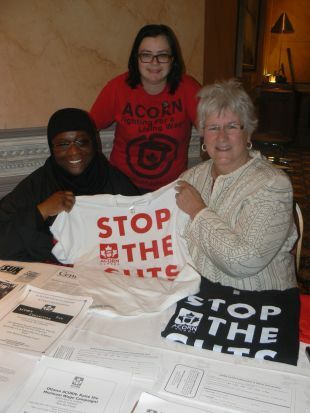 ACORN members in BC are fighting to end poverty with allies in the BC Poverty Reduction Coalition. To learn more about some of the people living in poverty in BC, visit BC's Hardest Working. 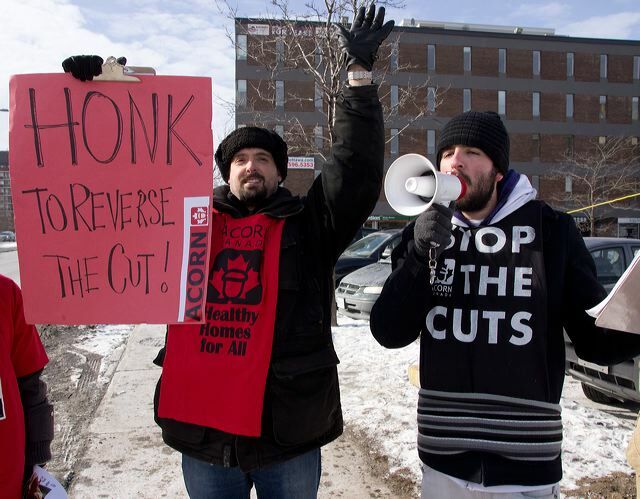 Read more about Ottawa: Reverse the Cuts! 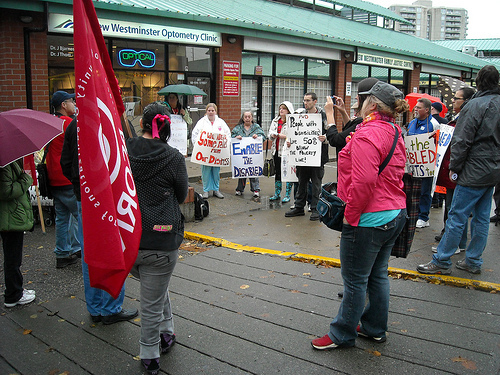 BC ACORN members in action on October 24th, 2012. The Disability Rights Group will continue to take action, every month, until their demands are met. For more information, or to join them in their important work, contact the BC ACORN office. Royal City resident Tom Page has firsthand knowledge about the financial struggles felt by people with disabilities. Page, who collects a disability benefits of $906 a month, said some people on disability get just over $700 a month. "I have fibromyalgia and severe osteoarthritis. I have also been diagnosed with bipolar disorder, although I am stabilized. I am 75 per cent deaf in both ears. I have a knee that has been operated on three times. It is difficult to walk because all the cartilage is gone, and it is now a bone-on-bone situation," he said. "I was told by an orthopedic surgeon I would be in a wheelchair when I was 55. I am 59 and still walking. I consider myself ahead of the game." Page has been on a disability pension for five years, having tried to work different jobs and to return to work various times through the years. "I worked all my life prior to that," he said of his deteriorating health. "My main career, I was a computer systems analyst. I went into business. I had an Internet business. I had a consulting business." Because of his health issues, Page is unable to do any work that is physical or stressful. "I am struggling," he said. "I'd like to go back to work if I could find something suitable." Before his health deteriorated, Page could run five miles a day, work out at the gym and participate in sports like swimming and squash. "It's difficult for a person who has lived a comfortable middle-class life to not only be disabled, but impoverished," he said. "That's the situation." Getting by each month is challenging for people on disability pensions, Page said. "It's extremely difficult, even with the food bank," he said. "It is difficult to eat a healthy diet. The food bank usage has increased. The amount you can get has decreased." Page recently joined about 35 members of ACORN in a protest outside the Ministry of Social Development office in New Westminster. 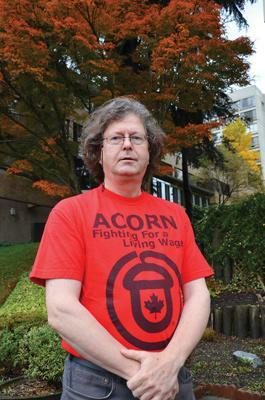 The New Westminster-based chapter of ACORN Canada tackles issues such as the need for safe and healthy rental housing and the need for increases to disability benefit rates. 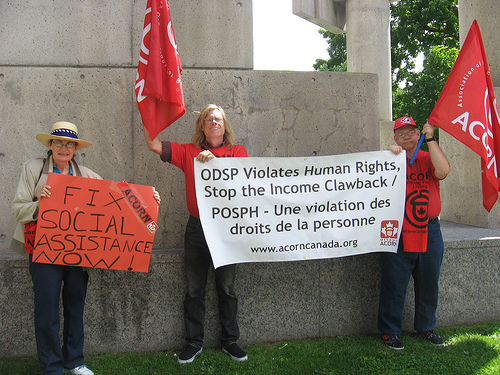 35 members of BC ACORN's Disabilty Rights Group took action last week. They rallied at an office of the Ministry of Social Development and delivered a letter to minister Moira Stillwell, which is copied below. The Disabilty Rights Group will continue to take action until the system that over 100,000 disabled British Colombians depend on is fixed. 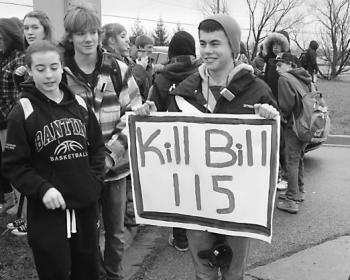 They were joined by John Bail, National Director of the Canadian Union of Postal Workers (CUPW) Pacific Region, who brought a message of solidarity.